by Dr. Jane Bluestein, Judy Lawrence, M.S.Ed. & SJ Sanchez, M.P.A. This book is included in our Free Book listing. Shipping charges will apply. OR order below at 70% off. This price includes free Media Mail shipping in the US. 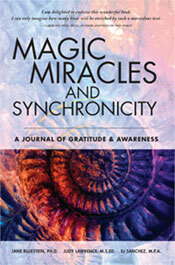 Before there was a book, there was an idea, and the original title for this idea was Magic, Miracles & Synchronicity. However, as we began to develop the content, our publisher targeted the chapter “Daily Riches” to use as the title of the book instead. While this chapter is certainly an essential component of this book, doing a second edition has allowed us to keep the same content with its timeless topics, and present it, this time around, with a title we feel better represents the spirit of our intentions. Of course, a new title deserves a new cover, and we were fortunate to find designer Derrick Leung, who came up with a design concept that truly conveys the essence and energy of this project. One significant change is in the arrangement of the twelve chapters. Once we started working with the content in presentations and seminars, a certain logic that was not immediately obvious began to emerge. In the second edition, you will find the chapters divided into four sections. The first includes tangible and concrete blessings, dimensions of gratitude that are probably the easiest and most obvious to see and appreciate. The next group of chapters includes concepts that are somewhat more abstract and intangible. This is followed by more personal blessings, dimensions relating to personal perspective, achievement, and self-appreciation. The final section includes one chapter, “Silver Linings,” to allow you to explore the often hidden blessings in some of life’s challenges. Although the chapters may be explored and used in any order desired, readers who decide to go through the chapters in the order presented in the book will probably find chapters becoming increasingly complex and challenging compared to the more random arrangement in the original edition. Regardless of the sequence in which the chapters appear, we still recommend using this book in the order in which it is most useful and meaningful to you. We truly believe that this book has matured into a product and format that will much better serve your needs and your process. As always, we wish you success and the joy of discovery in your journey. Note: This books makes a great gift for anyone who likes to journal, someone going through a challenging time, or a person who would appreciate dozens of inspiring and encouraging stories and quotes. Use your credit card or PayPal account to order Magic, Miracles and Synchronicity through a secure server online. Ask for an autograph. It’s free, too! A gratitude journal to help notice the blessings in your life, focus on the positive, and find the silver linings in challenges. Quotes, stories, and activities; for personal use or with groups. This book is free. The price helps cover our shipping costs.